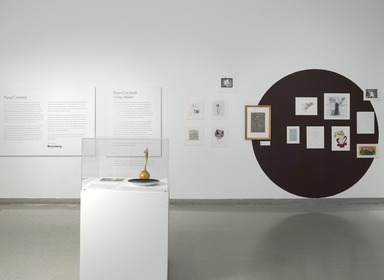 Ulrike Müller’s Raw/Cooked exhibition, Herstory Inventory, is a two-part, collaborative project. The first is inspired by the inventory of the extensive T-shirt collection housed at the Lesbian Herstory Archives, a grassroots organization in Park Slope. 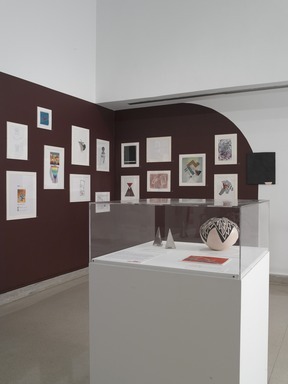 Müller distributed the T-shirt descriptions to collaborators, including feminists and queer artists, instructing them to translate the words into new images; the result, 100 Feminist Drawings by 100 Artists, is on view here. 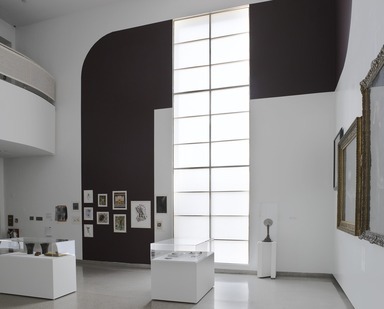 For the project’s second segment, Müller turned her attention to the Museum’s collection. She chose five key words that appear frequently on the inventory list and refer to lesbian, feminist, and queer symbolic imagery: flower, hand, rainbow, triangle, and axe. Using these terms to search the Museum’s collections online, Müller selected objects for display, accompanied by her written commentaries. Herstory Inventory begins in the fifth-floor elevator lobby and extends to the lobbies on the fourth, third, and second floors. Müller graduated from the Academy of Fine Arts, Vienna. Her studio is in Sunset Park, Brooklyn. The rainbow objects gathered in this case are made by American artists of both native and colonial heritage. Over the centuries, a range of mythological and spiritual meanings has been attributed to the rainbow. In its impermanence and immaterial beauty, this natural phenomenon can challenge our notions of what is real and possible. In 1978, a San Francisco–based artist designed a flag with rainbow-colored stripes as a symbol of the diversity and unity of the LGBT community. Today this banner is internationally recognized. It is flown at gay and lesbian pride marches and other gatherings and displayed to mark community centers and queer-friendly businesses around the world. 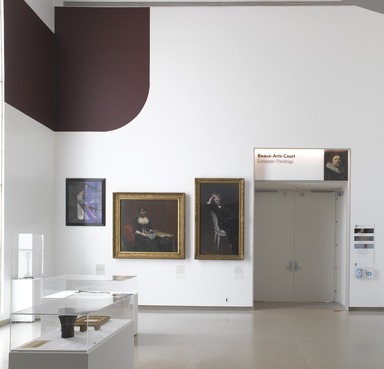 The objects within this category feature triangular forms and zigzag lines, and they were all made by or for women. 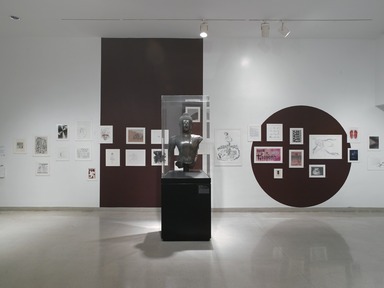 Displayed as a group, they propose an open and speculative response to questions regarding the absence or presence of queer bodies in the Museum. Can cultural invisibility be challenged by experimental, imaginative ways of looking? As a symbol of gay liberation the triangle signifies pride and solidarity, but it also memorializes a history of homophobic violence. During the German Nazi regime (1933–45) homosexual men and “antisocial” women (a category that included feminists and lesbians) were persecuted and often killed. In concentration camps their prisoners’ uniforms were marked with pink or black triangular badges. Hands are powerful symbols in many cultures, as seen in the ancient Egyptian amulets and Buddhist ritual gesture on display here. Hands guide, protect, and signal. A cast of the hand of a beloved person may be a souvenir, but it may also contain a possessive claim—the one displayed here is prominently adorned with a ring that signifies marriage. In drawings nearby, hands form fists and assume more immediately passionate meanings. Fists represent struggle and resistance to oppression, as in the radical feminist symbol that features a clenched fist in the center of the symbol for woman. Hands touch, stroke, pet, hit, poke, and penetrate; they are sensual, sexual, and political. Hands refer to agency, the ability to do things that affect others and the world. The objects in this category present various ways of looking at flowers, in particular the white lily. This case displays the highly stylized form of an art deco vase together with an elegant black-and-white calyx on a dinner plate and a blocky lily printed on paper, whereas the watercolor installed on the wall nearby is based on careful botanical observation. The subject matter is handled very differently in each of these pieces, yet they all respond to the lily’s suggestive form. Historically, flower painting was considered a “minor” art form accessible to women and others excluded from life drawing classes and arts academies. Flowers, especially irises, appear in lesbian and feminist imagery owing to their seductive beauty and sexualized formal connotations. Axes, swords, and knives can be tools or weapons. Whether their purpose is quotidian or ceremonial, the care applied to their form and adornment speaks to this power. 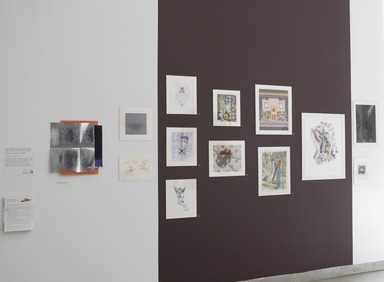 February 1, 2012 The fifth and final exhibition in the Raw/Cooked series presents the work of artist Ulrike Müller and will be on view at the Brooklyn Museum from June 29 through September 9, 2012. 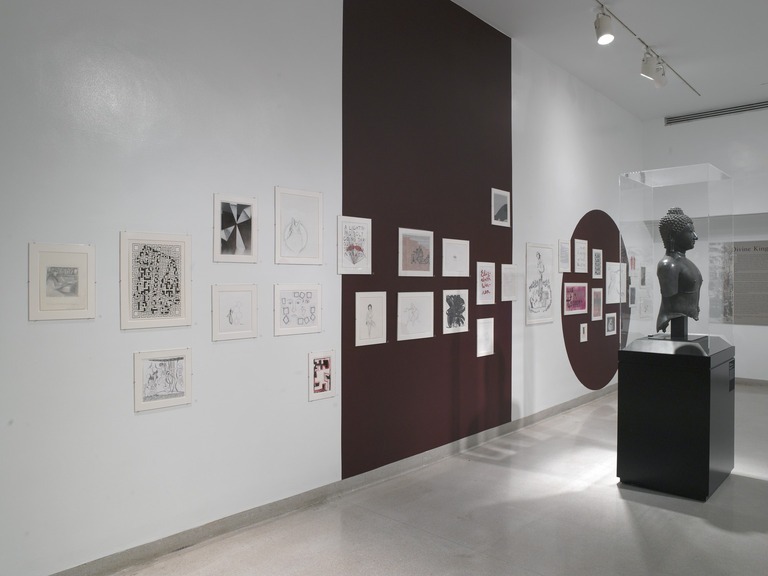 Raw/Cooked is a major series of five ten-week-long exhibitions of under-the-radar Brooklyn artists. The series is sponsored by Bloomberg. The L Magazine is print media sponsor. 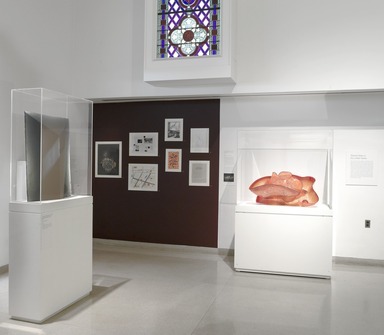 Müller, whose studio is in Sunset Park, Brooklyn, is interested in starting a conversation on the lesbian feminist movement and examining the visibility of queer bodies within mainstream culture and the Museum. Müller has orchestrated a collaborative drawing project that is based on the inventory list of the feminist T-shirt collection at the Lesbian Herstory Archives in Park Slope. She has distributed the textual T-shirt descriptions to feminists, queer artists, and other interested New Yorkers, and asked that they translate these texts into new images. 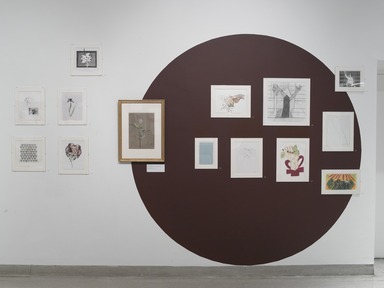 In her Raw/Cooked exhibition, Müller will be exhibiting one hundred drawings from this project. 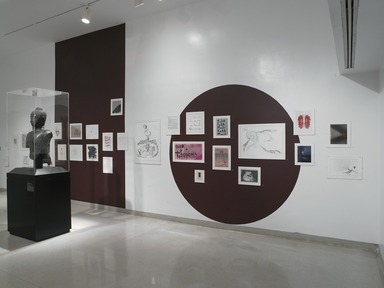 Additionally, she has taken symbolic lesbian, feminist, and queer terms from the inventory and used them as search criteria to mine the Museum’s collection. 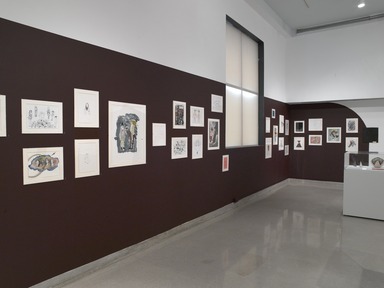 In displaying the collaborative drawings and nearly twenty-five Museum collection objects in the Luce Center for American Art’s Elevator Lobby and throughout the Museum, Müller is creating a visual dialogue among contemporary queer culture, the Museum, and activist feminist history. 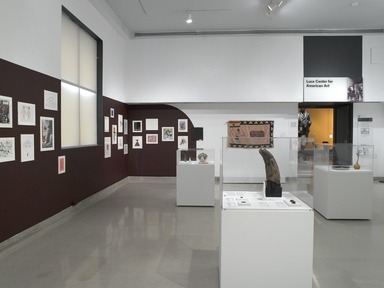 The artists considered for participation in Raw/Cooked were selected by an advisory board of established Brooklyn artists, including Ron Gorchov, Michael Joo, Paul Ramírez Jonas, Amy Sillman, and Mickalene Thomas, who were asked to nominate artists without gallery representation who had not yet had a major museum exhibition. 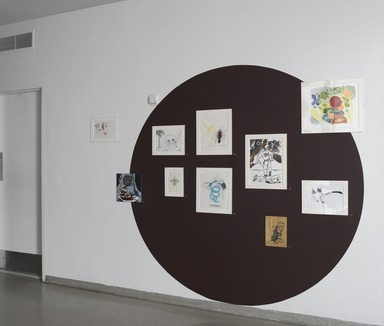 Ulrike Müller was recommended by Amy Sillman. The final selection of artists was made by Eugenie Tsai, John and Barbara Vogelstein Curator of Contemporary Art at the Brooklyn Museum. 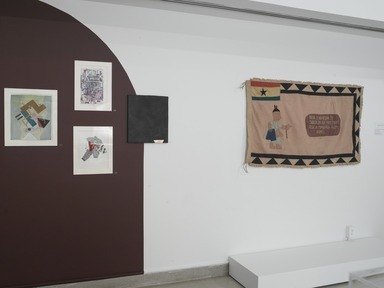 The artists were given the opportunity to present work in any medium and to propose using any space in the Museum for its display, however unconventional. 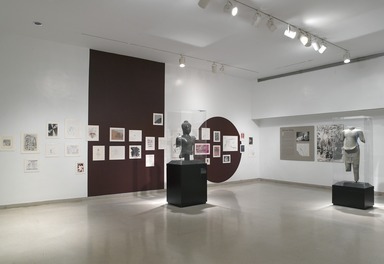 The artists’ projects could respond to the unique architecture or history of the building and/or the Museum’s collections. Raw/Cooked launched on September 16 with an exhibition of the work of Bushwick-based artist Kristof Wickman. Other Brooklyn artists who have been a part of the Raw/Cooked series include Bushwick-based Lan Tuazon, Red Hook’s Shura Chernozatonskaya, and Bedford-Stuyvesant–based Heather Hart. Raw/Cooked continues the Brooklyn Museum’s long tradition of presenting work by both up-and-coming and established Brooklyn artists, including the presentation of the extended exhibition series Working in Brooklyn and continuing with the major survey exhibition Open House (2004), which brought together the work of 200 Brooklyn artists.